mitmproxy: 交互式的, http包代理, 分析, 修改等. mitmdump: 非交互式的. 轻量级的tcpdump for http. An interactive console program that allows traffic flows to be intercepted, inspected, modified and replayed. 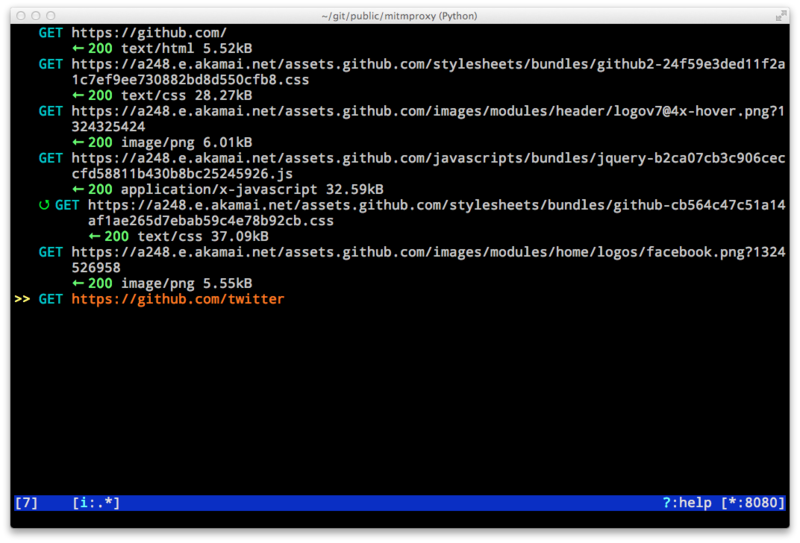 An interactive, SSL-capable man-in-the-middle proxy for HTTP with a console interface. 测试可以本地用python -m SimpleHTTPServer起一个http server, 然后curl --proxy http://localhost:8080 http://example.com来经过mitmproxy代理访问网站. 或者浏览器设置一个proxy. mitmproxy交互界面支持鼠标点击到某个请求展开, 也可以使用上下移动到指定的请求并按Enter展开; Tab或左右用于在展开后的Request, Response, Detail之间切换. Think tcpdump for HTTP - the same functionality as mitmproxy without the frills. Command-line version of mitmproxy. Think tcpdump for HTTP.